← How Do I Choose the Right Hair Stylist? Real Hair vs. Synthetic Hair Wigs: Which One is Right for Me? Posted on July 27, 2015	by Janelle P.
A variety of human hair and synthetic hair wigs are available at Wigs Works and Extensions for Hair Salon. If you are considering buying a wig or hair piece, one of the first decisions that you will need to make is whether you want one that is made from human hair or synthetic hair. Here is a brief breakdown of the pros and cons of each. There is nothing quite like the quality, look and feel of real hair. It is more durable than synthetic hair wigs and can last up to a year. You can change the style and color just as you would your natural hair. With synthetic wigs, the curl is set into the fibers and it can’t be re-colored. 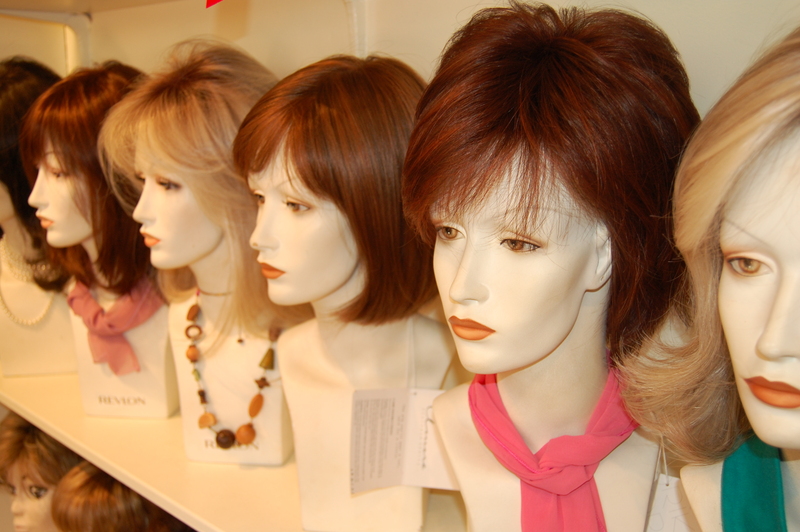 Human hair wigs are quite a bit more expensive than synthetic ones. Human hair requires more care. It will need to be conditioned since it doesn’t have the natural oils from the scalp moisturizing it. It will need to be styled and refreshed more frequently just as you would your natural hair (especially in harsh climates). It can be heavier than synthetic wigs of a similar style and length. Synthetic hair has made amazing strides in the past few years. With a top quality wig, you would be hard pressed to tell the difference between a synthetic wig and a human hair one. It comes out of the box styled and ready to wear. Many have “memory” fibers that hold curl and wave so you don’t have to worrying about frequent touch ups. Since the fibers are made from plastics, it holds its style better during wet or humid weather without frizzing or going flat. The color will not fade or oxidize as with real hair. They are much less expensive than human hair wigs. Synthetic wigs last from 4-6 months as compared to human hair wigs that can last up to one year (and heat friendly synthetic hair lasts about 2- 3 months). With synthetic fibers, it is more difficult to change your style as with human hair. Many synthetic fibers will melt if you use heated styling tools on them and even those that are “heat defiant” need to be styled with extreme caution. A poor quality synthetic wig can look shiny and unnatural. While you may have done a ton of research, the best way to make your final decision whether a human hair or synthetic wig is right for you is to touch one, try it on, and discuss your lifestyle (budget, frequency of wear, and styling options) with a hair care professional. At Wig Works and Extensions for Hair Salon, we have hundreds of human hair and synthetic hair wigs in stock so that you can see firsthand which option will work best for you.